Holdem Indicator does its job well, calculating odds, making simple plays obvious, and tracking statistics on opponents. This is probably our favorite odds calculator primarily because it isn't just an odds calculator. Holdem Indicator does everything! Hold'em Indicator is one of our favorite poker odds calculators. The opponent tracking is very helpful and will help beginning players get ready to use Holdem Manager and PokerTracker. The odds calculation portion works perfectly and the advice is usually correct. As with all odds calculators, we recommend using them until you have a good grasp of the odds yourself. As a teaching tool, Holdem Indicator works well and all of the pieces of the program are simple and very easy to use. With many odds calculators, we find that the advice is generally not much better than a random guess, but Holdem Indicator does a much better job. Holdem Indicator gives you the EV of your cards pre-flop by using the massive sample of hands available from PokerRoom.com, which gives you some idea about correct pre-flop play. A machine can't tell you to raise because the blinds are tight and your table image is strong right now, but it does give you better EV estimates pre-flop than any other program we have seen. It can even give you the Sklansky Group for your hand. As you can see, Hold'em Indicator offers advanced functionality that many odds caclulators do not. We definitely recommend trying this program to see just how easy it is to use and how useful the detailed information can be. Also, be sure to check out Omaha Indicator, Tournament Indicator, Stud Indicator, and iHoldem Indicator. PokerSoftware: What separates Holdem Indicator from other programs like it? 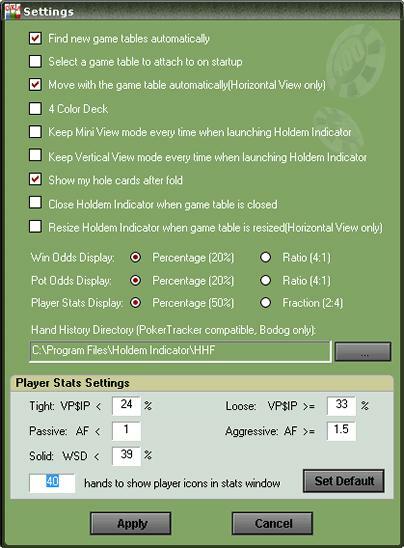 Holdem Indicator: Our software provides poker win odds and player stats in an easy-to-understand, easy-to-use interface. Holdem Indicator is an ideal and comprehensive tool for online poker players. PokerSoftware.com: Can you talk about its primary features? Holdem Indicator: It offers instant poker odds, outs, EV, starting hand strength, real-time opponent statistics, and your opponents' mucked cards. Holdem Indicator works with all major online poker sites. Also, PokerStars officially approved the program for use. PokerSoftware.com: What feedback have you received from customers? How have you adjusted Holdem Indicator accordingly? Holdem Indicator: Holdem Indicator has been on the market for many years. We have received a lot of feedback and suggestions from our customers and have made a lot of improvements to our products. PokerSoftware.com: What features will be rolling out in the future? Holdem Indicator: We're working now to add an HUD overlay and Hand Replayer. They are two very useful features that our customers will enjoy. PokerSoftware.com: Where did the idea for Holdem Indicator come from? Holdem Indicator: We're online poker players ourselves. We wanted to have a handy tool that is informative and easy to use. PokerSoftware.com: What should users with support questions do? Holdem Indicator: If a customer has a question or concern, they can send us an e-mail directly. Usually, we'll get back to them within an hour or two. We have very good 24/7 customer support. PokerSoftware.com: Holdem Indicator offers some of the most straightforward, user-friendly graphic interfaces in the industry. Was this a priority? Holdem Indicator: The easy-to-use graphic interface of Holdem Indicator is one of its top features. It also has much more than the interface, though, such as the accurate odds, real-time stats, and compatibility with major online poker sites.